Oooh - I'll have to keep a look out for these!! cool I think I'll look out for the blue and the orange. 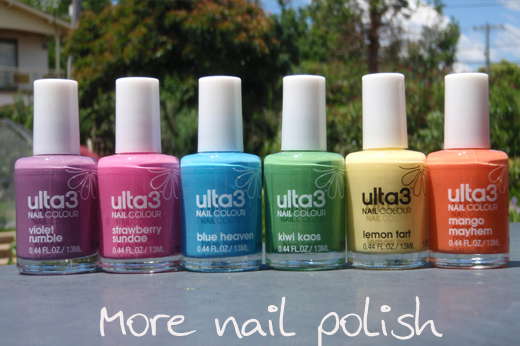 I got some junk mail today advertising Ulta3s 4 for $5 this week at the local chemist. Nice colors! I'll have to pick these up. I like the green, blue and purple best. Merry christmas to you!!! a bit late though..but was off computer the whole weekend! I have the purple (Which is Violet Rumble, not Crumble, btw), green and pink, and I'm loving them. I wasn't sure on the blue (In bottle it looked close to a maybelline blue I have) and the yellow (Looks like NYC's Lemon/Ulta3's Spring Blossom). I am definitely going to be on the look out, now, for the blue and the orange. 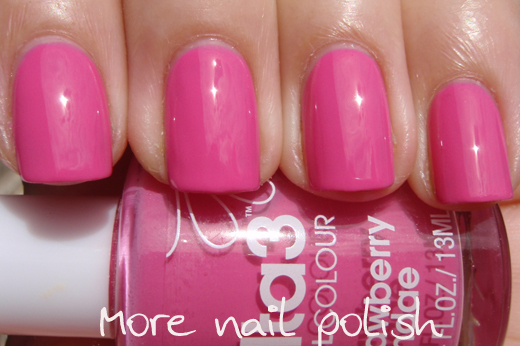 Those polishes are gorgeous, I wish my local chemist would hurry up and get these colours in hehe! I'm loving the blue and the orange <3 Thanks for the swatches! Finally, a non-fluoro ulta3 orange creme! :D The yellow looks a bit too similar to Spring Blossom to me but I'm loving the other colours. Pity about the formula! I almost checked if these were in stores yet yesterday. I'm regretting it now.